The “Taylor principle” is not necessary (indeed, it is harmful). The nominal economy remains stationary even under an interest rate peg. There is no “deflationary trap”, despite the Zero Lower Bound on nominal interest rates. In the vicinity of steady state, the aggregate price level — and not just the rate of inflation — is determinate, despite the central bank targeting inflation. The no-bubble condition is achieved by central bank design rather than by assumption. A systematic response of the central bank to the state of the economy (e.g. 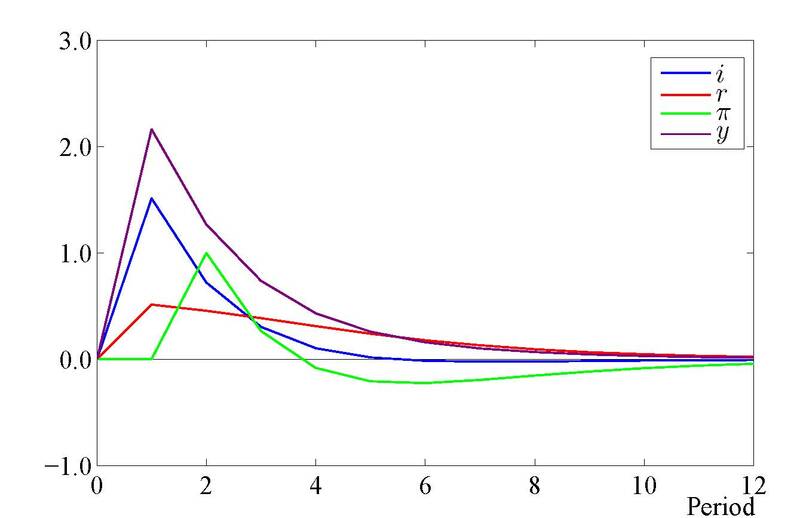 via a Taylor rule) reduces the depth of recessions, but may lengthen their duration. The coefficients of the Taylor rule do feature in the equilibrium conditions, so they are empirically identifiable (contra Cochrane, 2011). Instead of firms having full information while prices are somehow “sticky”, prices are flexible but firms have incomplete and heterogeneous information. That prices are set without full information is self-evident. Klenow and Malin (2010) also document that the median duration of a price in America is less than four months (although the mean and other countries’ medians are longer). Instead of responding to current inflation and output, the central bank responds to expected future inflation and output. The Bank of England’s monetary policy remit acknowledges that “[t]he inflation target is forward-looking to ensure inflation expectations are firmly anchored in the medium term”. Other central banks are similar, if perhaps not quite so explicit. The central bank violatesthe Taylor principle when in steady state, but not necessarily when out of steady state. Coibion and Gorodnichenko (2012) show that a Taylor rule estimated using Greenbook forecasts for America without interest rate smoothing violates the Taylor principle for the Greenspan era, while Creel and Hubert (2015) observe violations in Canada, the UK and Sweden. Of course, most researchers consequently infer that interest rate smoothing must be present, but this is because they take the need for the Taylor principle to be axiomatically true. With these modifications, it’s no longer necessary to express everything in terms of inflation. The textbook model requires this because the previous-period price level appears in two places: once in the expression for the current price level (since some firms cannot update their prices) and once in the central bank’s decision rule (because a response to the current rate of price inflation implies a response to yesterday’s price level). But when prices are flexible and the central bank responds to expected future inflation, the previous-period price level does not appear anywhere in the solution, leaving only current and future prices to consider. These imply that, without further fundamental shocks, agents will not make any forecast errors. But if agents’ information sets are incomplete, the researcher must describe how agents combine noisy signals to form beliefs about the unknown state of the economy. By deriving agents’ optimal linear estimator (the Kalman filter), the researcher consequently specifies the exact process for their expectation errors, including forecast errors. With strategic complementarity, agents are interested in other agents’ average belief, and the average belief about the average belief, and so on. The full state then contains both the underlying state (the exogenous shocks) and the hierarchy of agents’ average expectations about them. The Kalman filter therefore also defines the law of motion for the full state of the economy. 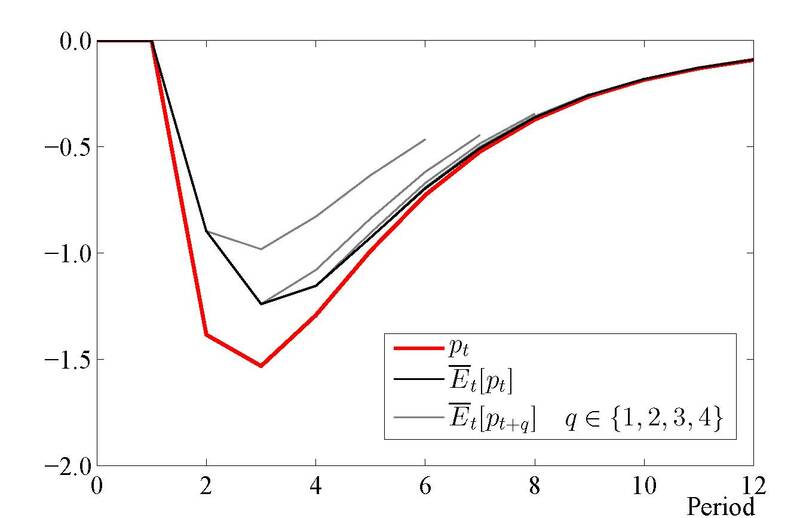 Critically, since all expectations (including forecasts of future variables) are based on current and past signals, the overall economy has a backward-looking structure, despite all individual agents being fully optimising, rational and forward-looking: all variables have explicit, moving-average representations as weighted sums of past exogenous shocks. Stability in expectations of future prices. Stability in the current hierarchy of expectations. The first requirement is similar to the no-bubble condition, requiring that be finite, where is the equilibrium discount factor. 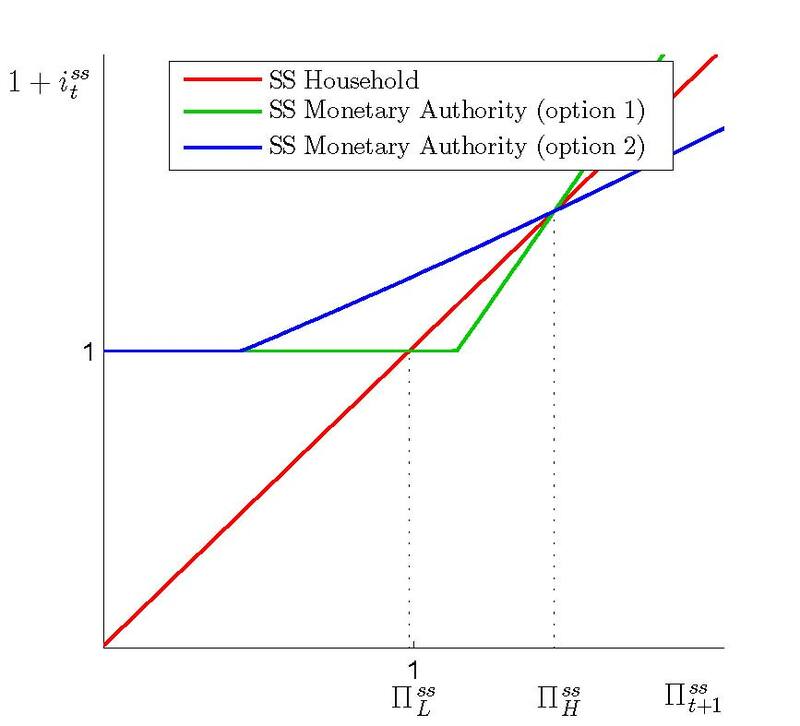 The value of is independent of the household’s discount factor (as prices are flexible) and is instead a function of only the elasticity of intertemporal substitution and the central bank’s coefficient on next-period output. The no-bubble condition is therefore achieved by central bank design rather than by assumption. The second requirement depends on firms’ equilibrium strategic complementarity, which is an increasing function of the central bank’s coefficient on next-period inflation ( ). Prices are stationary when , but when , firms place increasing weight on higher-order expectations and the price level explodes following a shock. This is quite different to the explosive dynamics induced by the eigenvalue restriction of Blanchard-Kahn (from which the Taylor principle emerges) and is not addressed by the no-bubble condition. What of the Taylor principle? The language of the Taylor principle is quite simple. By raising the nominal interest rate by more than one-for-one in response to an increase in inflation, the central bank ensures that the real interest rate rises. This subdues economic activity, which then dampens inflation. Cochrane (2011) calls this “Old Keynesian” logic and emphasises the tension with the mathematics of NK models solved via Blanchard-Kahn, where the Taylor principle causes explosive behaviour in order to achieve determinacy (the no-bubble condition then rules out explosive behaviour to achieve stability). When the Taylor principle is violated, NK models become stable, but with full information they are then indeterminate. A model that violates the Taylor principle and specifies the process for signal extraction (and thus, the forecast error) is therefore both stable and determinate. The language of the principle can remain intact, however, at least for demand shocks. All that it requires is that the shock must cause both expected future inflation and output to rise and the central bank’s reaction function must place sufficient cumulative weight on these two variables. 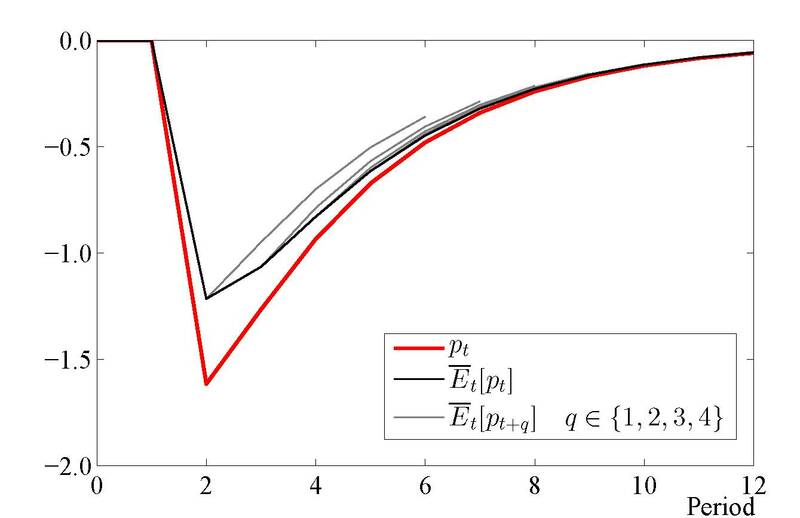 Figure 1 illustrates this point, plotting impulse responses for the nominal rate, real rate, inflation and output following a shock to the household discount factor in my model when the Taylor-type rule is . Perhaps the most striking — and policy-relevant — result is that my model features no “deflationary trap”. Indeed, prices remain stable even under an interest rate peg, where the nominal interest rate is exogenous to the economy. 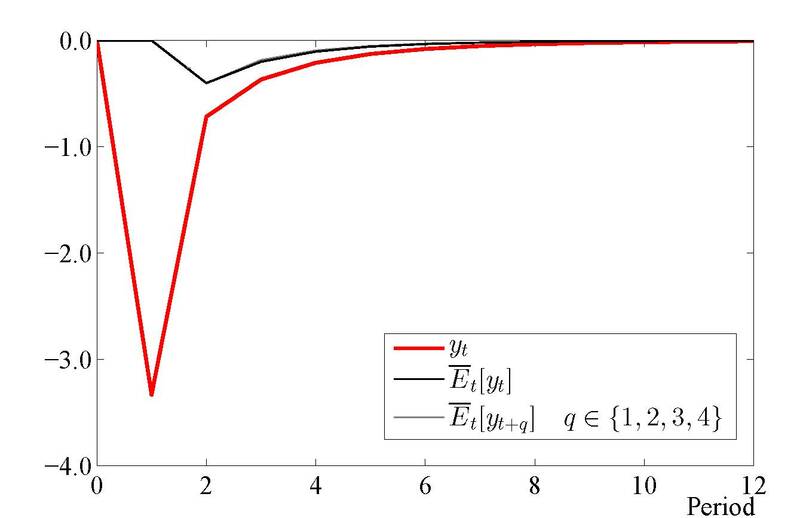 In Figure 2, the red line is the Fisher equation (the steady-state Euler equation); its slope is the steady-state gross real interest rate. The green line shows the central bank’s decision rule under the standard NK model that satisfies the Taylor principle where it can, but — as explored by Benhabib, Schmitt-Grohe and Uribe (2001) — recognises the existence of the ZLB. There are two steady-state equilibria: a stable “deflationary trap” and an unstable (by construction) desired equilibrium. By contrast, the blue line shows an admissible decision rule when firms have dispersed information. 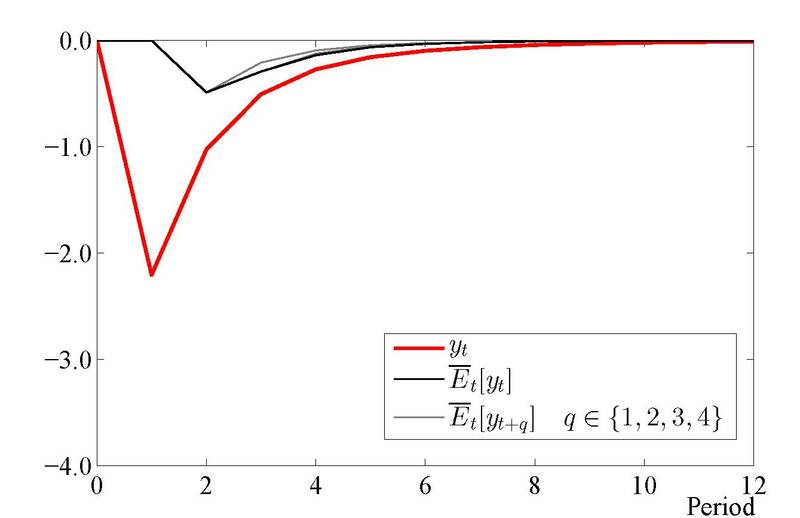 There is a single, stable and determinate steady-state equilibrium, despite the ZLB. An interest rate peg would set the slope of the blue line to zero. Figure 3 shows impulse responses following a monetary shock under two regimes. Interestingly, a Taylor-type rule makes the recession shallower than an interest rate peg, but more prolonged, because firms remain uncertain whether the recovery is driven by the policy response or offsetting beneficial shocks. The results of this paper are striking, but they emerge from a textbook model with entirely plausible adjustments. If we believe the model, we may need to be willing to revisit some of our most basic descriptions of how central banks work. Authors: John Barrdear works in the Bank’s Monetary Assessment and Strategy Division. Previous Post Does business intelligence still point to labour market slack? Next Post Will a Fed rate hike affect house prices in emerging markets?